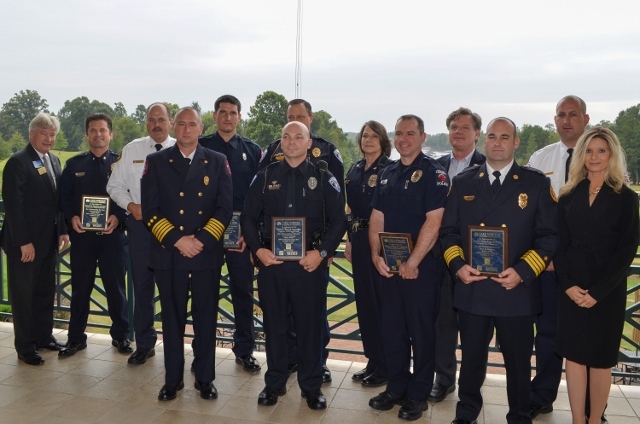 The Lake Norman Chamber of Commerce saluted the men and women who work tirelessly to protect and serve the families and businesses of the Lake Norman region at a Public Safety Luncheon held at the Peninsula Club in Cornelius. The eighth annual event was keynoted by Tamara Williams, Dean of Central Piedmont Community College – Merancas Campus. Dean Williams shared the role CPCC plays in training public safety officers and first responders. Chamber president Bill Russell, emceed the event and spoke to the critical role the police, fire, and first responders play in making the community a great place to live, work, and visit. Russell and 2013 Chamber Chairman of the Board Wendy Moran, presented awards to the most outstanding officer from each North Mecklenburg department, selected by their respective chief. The awards program was presented by Wells Fargo Bank and sponsored by Lake Norman Publications, Central Piedmont Community College, and the Peninsula Club. The Lake Norman Chamber Public Service Award recipients for 2013 included: Officer Joseph Squashic – Cornelius Police Department, Officer Phillip E. Geiger, Jr – Davidson Police Department, Detective Jennifer Sprague – Huntersville Police Department, Firefighter Bill Shick – Cornelius Fire Department, Deputy Chief Ryan Monteith – Davidson Fire Department, Firefighter Bill Suthard – Huntersville Fire Department, and Brandy N. Lankford – North Mecklenburg Rescue Squad, Inc. The Lake Norman Chamber of Commerce represents approximately 1,000 businesses in the Cornelius, Davidson, Huntersville, and greater Lake Norman region. For more information about the Chamber visit LakeNormanChamber.org.